Winner of the ‘Best Residential High-Rise Architecture’ accolade by the International Property Awards 2017, Baltimore Tower (also referred to as Arena Tower) presents luxury living at extraordinary heights in a coveted corner of this world class city. Rising up to 450ft above Canary Wharf’s iconic skyline, architects Skidmore, Owings and Merrill’s majestic design incorporates glazed outer rings that shift at each level by minute degrees, providing solar shading for private balconies and terraces and, in turn, creating a distinctive visual twist. 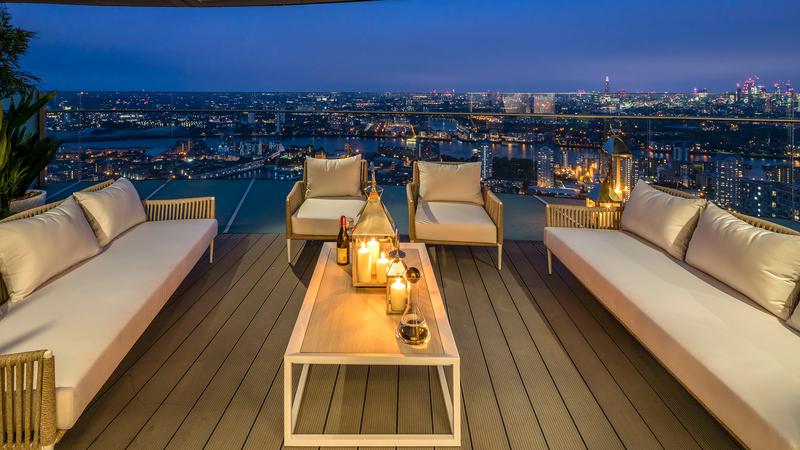 From the second to the 45th floor resides a sensational collection of one, two and three bedroom apartments and penthouses, offering breathtaking views towards Canary Wharf in the north, The O2 Arena in the east, Maritime Greenwich in the south and The Shard in the west. Residents can enjoy a host of elite amenities, including access to the largest residential gym in London, via the adjacent Baltimore Wharf building. Here residents can enjoy a fully-equipped cardio suite and a 25m world championship length swimming pool. Other lifestyle facilities include a private screening room, whilst a sky level bar/restaurant is expected to occupy levels 43 to 45. Home to the global headquarters of the world’s leading financial institutions, Canary Wharf is well-known as London’s centre of corporate activity; however in recent years, this prominent Docklands district has evolved to so much more. The area now offers extensive cultural and entertainment options, from Michelin-star dining at ROKA to designer shopping at Crossrail Place. For those craving green space, historic Greenwich is just a six minute journey away via the DLR and boasts London’s oldest Royal Park, along with the UNESCO World Heritage Site, Maritime Greenwich.